Ferrets love to explore their surroundings. They can wander far if you let them loose. You may let them go around the yard to have some sunshine, but if there is not any form of restraint, your pet can get easily harmed or may get into trouble any time soon. 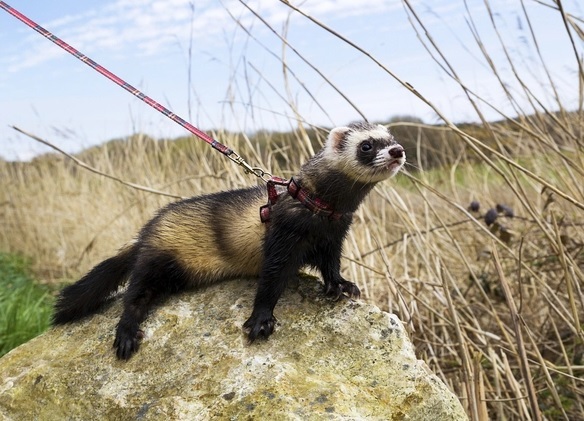 To make sure that your pet stays safe even while it stays outside for some air, I suggest you train it on how to use a harness and leash for ferrets. This simple guide will teach you how to do it. There are ferrets that enjoy exploring around with their owner and a harness or a leash on. There are those who may not want to wear one at the beginning of the training but will eventually get used to it. In time, they get to tolerate the idea of wearing a harness, so they will just follow what they are told to do to wear either a harness or a leash properly. There are also some ferrets that just won’t wear one, no matter what you do to teach them how. If your ferret is one of those, you can’t just force it to wear a harness. You may find your pet twisting or stretching just to let the harness off its body and legs. It will be easier to train your pet ferret while it is still young. You can start training your furry friend as early as on its 10th week. The best way to do the training is within a confined space or at home. Make sure that you introduce the leash to your pet gradually. It will take a while before your ferret will get used to it, so just be patient. Give your pet some time to get adjusted to it. Reward your ferret by giving it food treats every time it shows a positive behavior during the training. Make the training time a fun time that your furry friend will look forward to. You will also need to go slowly when training your pet. Increase the time that your furry friend will have to wear the leash gradually. You also need to make sure that throughout the training session, you are there to make sure that your pet will be safe. As for adult ferrets, they can also be trained. It will take a little longer to accomplish, however. But you don’t really need to rush. You will soon see some progress if you will just be patient. Start by leaving the harness and the leash on your ferret. Allow your pet to get used to seeing the harness and the leash. Just let it drag them around. Once you notice that your pet is beginning to like the idea of having a harness and a leash on, you can now try to hold on the leash. If you notice that your ferret seems not to mind at all, you can now begin loosely pulling the leash and leading your pet outside. When doing so, make sure that you won’t pull hard or you may find your pet struggling as it may think that you are restraining it. Instead, be gentle throughout the training and soon you will see your pet enjoying the training time until it will think it’s natural for it to be wearing a harness and a leash whenever it goes out with you. Your furry friend will need a snug-fitting H-style harness. You may consider buying a collar instead, but it won’t really be that be as effective as a harness since your pet can just easily wriggle out of it. A properly-fitting harness is essential in ensuring the comfort and safety of your pet, so you have to make sure that you buy one that will fit well– not too tight nor too loose. The best way to find the right-fitting harness is to bring your pet ferret to a local pet store and have it try a few samples before you buy one. If the store owner does not allow this, you may consider looking for sellers who can provide a demo that you may try on your ferret. If you have found the right harness, we will appreciate it if you can share your experience with others so that they may also learn a thing or two from it as well. Before you can train your pet to walk with a harness in a public area, you will need to let it be acquainted with the people and sounds surrounding it. Your ferret needs to get used to a different environment so that it will act normally once exposed to it while wearing a leash and harness. You also need to keep watch of your ferret and make sure to hold on your pet’s leash tightly. This does not mean that you will be pulling hard on your pet whenever it looks like it is beginning to stray. Just make sure that your pet is at a safe distance and that you are confident that your hold on its leash won’t let your fuzzy friend escape and stray where there may be unfriendly animals, chew on plants or any inappropriate objects that may be dangerous to your pet’s health. Though the training may take only a few minutes, you may still need to bring some food and water for your ferry. You may use these as positive reinforcement while training. You may also need to check your ferret for any injury, ticks, and other insects that may get stuck on its feet and fur. Also, remember to keep the training short. Don’t let your pet to walk in a very hot pavement or surrounding as your ferret is quite prone to heatstroke. Finally, you will need to bring a carrier so you can carry your pet home or when it gets tired after the training. Copyright © 2019 Skate Dog Studios.